It is critical to apply grease properly when replacing fuser film sleeves, and it is also important to apply the right type of grease. Let us help you demystify the process for choosing the right grease and save some money. The grease is used to lubricate fuser film sleeves. It is critical to apply grease properly when replacing fuser film sleeves, and it is also important to apply the right type of grease. If incorrect grease is applied, the film sleeve may stop turning after printing for a long time and cause paper jam due to dry out of the grease. For step by step fuser film sleeve replacement instruction, check out our article for Fuser Film Sleeve Installation Instruction. When it comes to purchase grease for fuser film sleeves, it could be confusing. To make the answer short, HP-300 grease will work for all types of fuser film sleeves. Our HP-300 grease comes in two sizes, 2g (GRS-HP300-2G) and 20G (GRS-HP300-20G). For one fuser film sleeve replacement, 2g (GRS-HP300-2G) is sufficient. 2G of HP-300 grease may be enough for two film sleeves at most. The downside of HP-300 grease is that it is very expensive. At Partsmart, we carry two types of grease. One is fully fluorinated polymer grease called HP-300. Another type is silicon based grease. 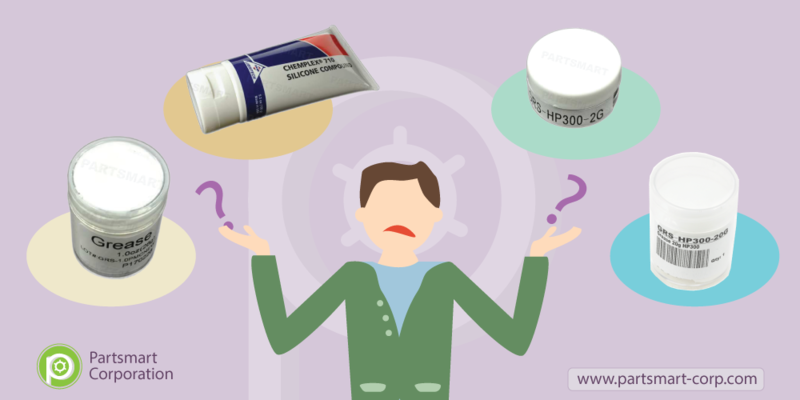 HP-300 grease is for high speed printers and fuser film sleeves with metal base, whereas silicon based grease is for low to medium speed (5 ppm - 25 ppm) printers and fuser film sleeves with polymer base. In below we have listed the ideal grease type for different fuser film sleeves. The metal base sleeves are built for newer models of printer, such as HP LaserJet P4014, HP LaserJet Enterprise M601, HP LaserJet 4250, HP LaserJet 4300, and most color printers such as HP Color LaserJet 4700, HP Color LaserJet CP2025, HP Color LaserJet CP3525 etc. These types of printers run fast and require more efficient heat transfer. Therefore, the sleeves require grease that provides extraordinary performance under extreme conditions. GRS-HP-300 in 2G package - 2 gram grease is enough for 2 film sleeves. GRS-HP-300 in 20G package - 20 gram grease is enough for about 20 film sleeves. For older model printers, such as HP LaserJet 1200, HP LaserJet 1300, HP LaserJet 2100, HP LaserJet 2200, HP LaserJet 2300, HP LaserJet 2400, HP Laserjet 4000, HP LaserJet 4100, HP LaserJet 6P and HP LaserJet 6L etc., the fuser film sleeves are made with polymer base. These types of fuser film sleeves are suitable for low to medium speed printers and only require grease that provide good performance under relatively high temperature. GRS-1.0 in 1 oz package -1 oz grease is enough for 25 film sleeves. GRS-5.3 in 5.3 oz package - 5.3 oz grease is enough for about 130 film sleeves.